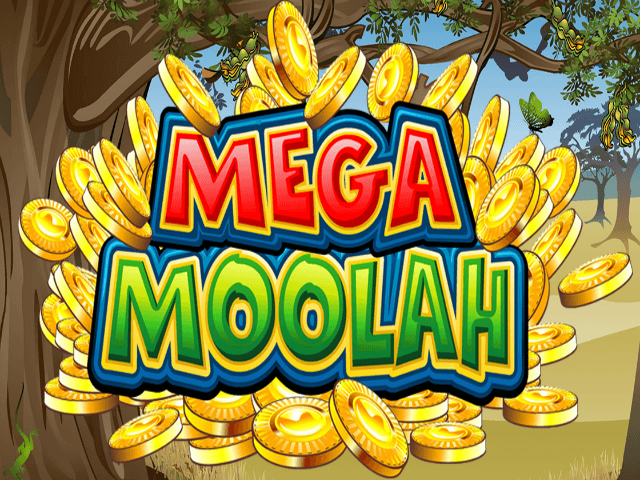 The Mega Moolah online slot is one of the most well-known games around, renowned for its record-setting and life-changing progressive jackpots that have made millionaires the world over. The five-reel Microgaming slot even has its own website. There are plenty of opportunities to win in the base game, too, with wild and scatter symbols and a Free Spins feature. Read our review to see why it’s one of the most popular slot titles in online casinos! 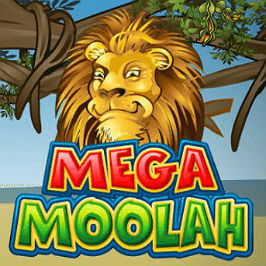 Play Mega Moolah Slot Demo for Free! Play Mega Moolah for Real Money! Because of the progressive jackpots it’s easy to gloss over the visual aspect of the Mega Moolah slot, but it has a cool and distinctive theme. The reels are set against the backdrop of an African savanna and the symbols are made up of animals you'd typically find in that environment, including lions, antelopes, zebras and giraffes, along with the card ranks from ten to ace. All 25 paylines are permanently active, so you just have to select your coin value and the number of coins between one and five. The maximum bet per coin is 5p, which is lower compared to other games but you can win up to 75,000 coins during the base game and as many as 225,000 during the free spins round. As you might expect, the mighty lion is the highest-paying character on the reels, awarding you 15,000 coins for landing five on a payline and 1,500 for getting four. The top four symbols pay out when you land just two of them, whereas you need to get at least three of the other icons to win anything. 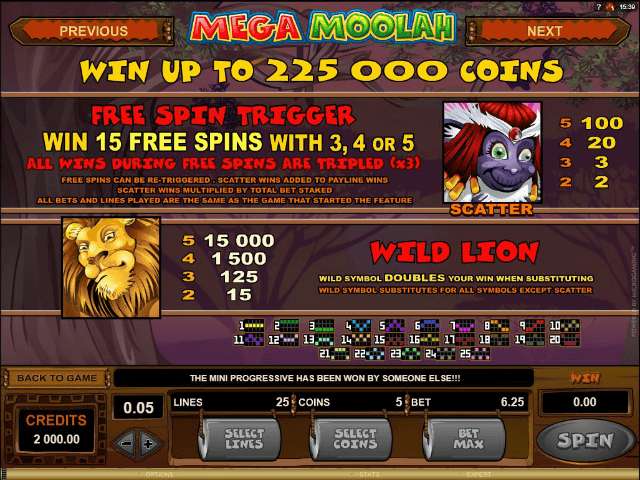 The Mega Moolah slot machine comes with a free spins feature that's triggered by landing three or more of the monkey scatter symbols. This grants you 15 free spins and the feature can be re-activated if you land three or more scatters again. And what’s more, all wins during the free spins round are trebled! Lions are wild in every sense of the word in this game, as the maned creature also acts as a wild, substituting for all other symbols except the scatter and doubling your winnings when it does so. 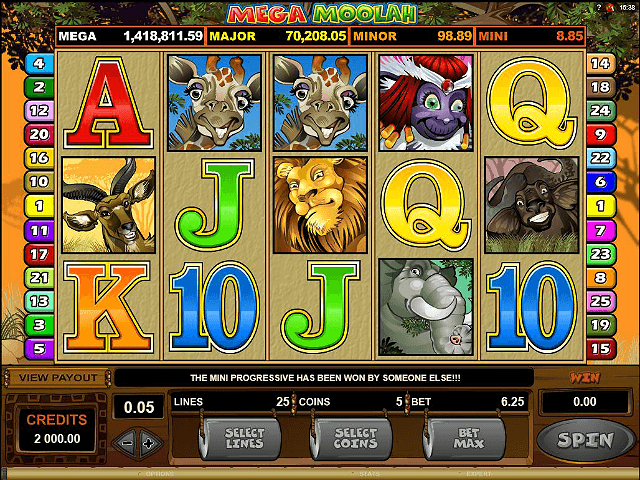 The Mega Moolah slot game certainly lives up to its name, offering the biggest jackpots you can find online. 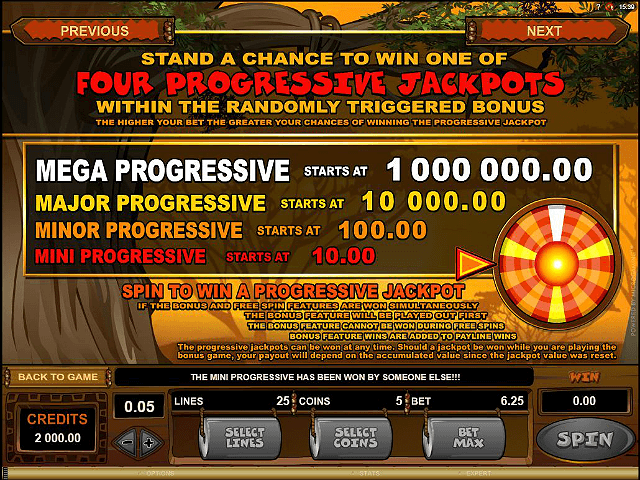 And you don’t even need to do anything to be in with a chance of bagging yourself some of the bounty, as the progressive jackpot feature is triggered randomly. There are four jackpots up for grabs: mini, minor, major and mega. You can see the prize pot for each one at the top of the screen as you’re playing, and every bet you make will add to it. You’ll also see a message pop up whenever one of the jackpots is won. If you're lucky enough to trigger the feature, you’ll spin a wheel to determine which of the four jackpots you win. The segments on the wheels are in four colours representing the four jackpots, with the smaller jackpots taking up more segments. There’s only one segment – the white one – for the top prize. The mega jackpot starts at one million – the highest minimum of any online jackpot game – and the slot is renowned for producing massive wins. Earlier this year, a new world record was set for the biggest jackpot won on a mobile device when a player scooped just over €8 million. There have also been two wins of over €6 million this year. These jackpot prizes are just too good to miss! Share this Mega Moolah Review today! If you like Mega Moolah, you'll love these slot titles too!